Etisalat Metro Station is the eastern terminus of the Green Line of the Dubai Metro. It is located on Al Nahda Street, between Al Qusais and Al Twar, and just north of Dubai International Airport. Etisalat is one of a handful of stations with a park-and-ride car park. It has spaces for 2,300 vehicles. The adjacent station on the Green Line is Al Qusais. Map showing location of Etisalat Metro Station. 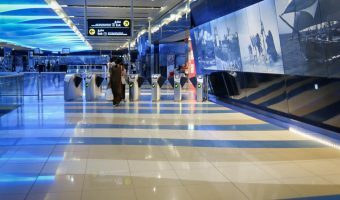 Guide to Al Qusais Metro Station.